Our ADHD/ADD experts have participated in over 150 national & local news interviews and they are here for you! Media Interviews our ADHD Experts | Adolescent ADHD Orlando area expert Jim West, MA, LMHC, NCC has been interviewed by local and national radio and TV new media and appeared on the Fox News, ABC Medical Minute, NBC, ABC, Fox 35, and more. He is a nationally certified, Florida state licensed counselor and specializes in ADD – ADHD (Attention Deficit Hyperactive Disorder) and ODD (Oppositional Defiance Disorder) working in the Orlando Central Florida area. American Psychiatric Association: Diagnostic and Statistical Manual of Mental Disorders, Fourth Edition, Text Revision. Washington, DC, American Psychiatric Association, 2014. Our Teen ADHD Counselors not only meet with your children, they get to know them in a much more exciting way then just talking. Our therapists go beyond traditional therapies and incorporate special techniques! Special Techniques like recreation therapy, video games, board games, and more! TLC ADD therapists interact with the children and make a connection while also making counseling comfortable and fun. Our child therapists often use groups, retreats, and camps to help the children while in a more social environment, not just within the walls of the counseling center. Popcorn, Xbox, and humor are a usual experience in a counseling session at our center. 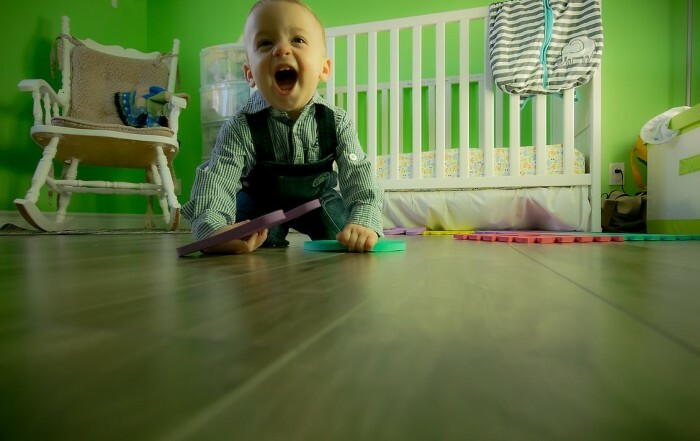 Your children will learn, connect, and have fun all while getting the benefits of counseling. In the past several years we have read articles, and watched television programs talking about the negative aspects of ADHD. ADHD has several positive aspects and if properly treated and educated families can nurture ADHD individuals that possess incredible creativity, entrepreneurial traits, spontaneity, sensitivity, passion and much more. Click here to see U.S. News & World Report article about famous people and celebrities with ADHD. Clients travel from the Central America, the Caribbean, South America, Egypt, Belgium and all over Florida as 85% of patients since 2003 did not need medication or their medication was reduced significantly. Clients benefited almost immediately from FDA approved supplements/vitamins and dietary changes. We take a holistic approach incorporating, parent/child or adult education, behavior modification, positive reinforcement, coordination with the school, support for the child, dietary interventions and referral for medication consults (if necessary). 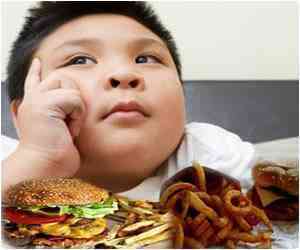 “Food for Thought – How what we Eat effects how we Think!” In February 2006 the FDA black labeled several drugs for ADHD. See this link for more information. 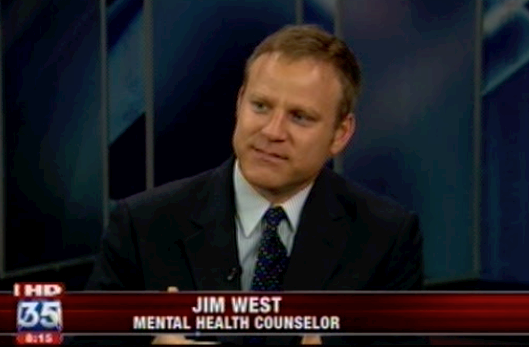 In order to keep up with demand for Jim’s expertise he has trained TLC Counselors to utilize his approach with ADHD. His positive approach to ADHD is refreshing and helps parents, and teachers get in the head of their students and truly empathize with their attentional issues. Stanford did a study that showed the learning style of the average person as follows: 89% Visual, 10% Auditory & 1% the remaining 3 senses. As we reflect on the teaching style in our schools we realize that the average student will struggle because the primary learning style is Auditory and then we expect an ADHD child that is primarily Visual and Tactile in their learning style to assimilate and learn. ADHD students are entrepreneurial, inventors like Thomas Edison, visionaries, creators, scientists like Albert Einstein, professional athletes like Terry Bradshaw, CEO’s, entertainers, and more because they are full of passion. If we can help them through school and let them loose in their area of passion they will far exceed their peers. An initial assessment and a plan by the end of your first meeting. 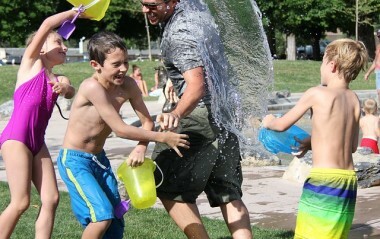 ADHD Parent Coaching – Our innate parenting skills works with 95% of kids, but students with ADHD are in the other 5%. Simple Behavioral Plans & Positive Reinforcement – Behavior Charts fail for 3 main reasons: All or Nothing rewards, Long Term Rewards, and Inconsistency. Food for Thought – Learn how Diet and Vitamin deficiencies can exacerbate ADHD symptoms and 85% of our clients do not need medication for ADHD or ADD. 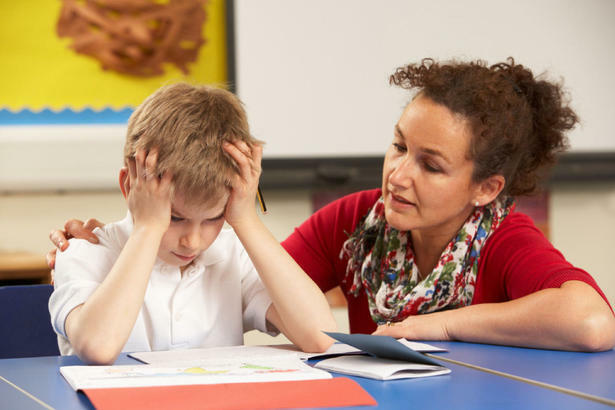 Some students may need additional support and can be referred to specialists that can assess neurotransmitters or food sensitivities to work toward a goal to treat ADHD symptoms without the medication. Our staff works with psychiatrists as well that use the least amount of medication if the diet, and supplements do not give a therapeutic response. Our experts know your students rights to receive an IEP or 504 Plan and we will advocate for the schools to give accommodations for your child. 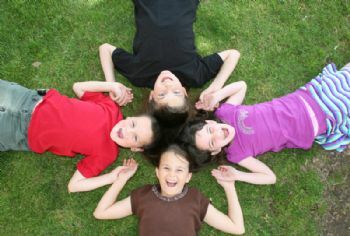 Social Skills Groups, Day Camps and Summer Camps to help close the social and emotional gap with most ADHD teenagers. Help parents to get on the same page and more. 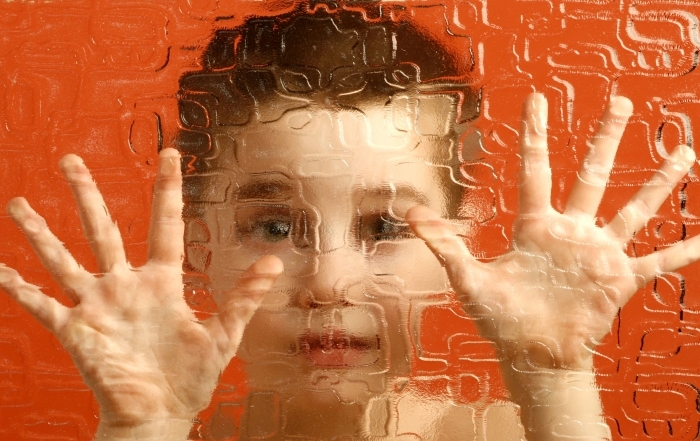 Social Delays | 60% of ADHD Students are behind Socially by up to 25%. Jim leads a social skills group for ages 6-10, 11-13 and 14-17. This group is covers anger management, social skills, dealing with perceptions, greeting people, starting conversation, resolving conflict, apologizing, etc. The group utilizes interactive games focusing on building trust, focusing, not interrupting, etc. Utilizes short Power Point presentations to maintain attention and focus. 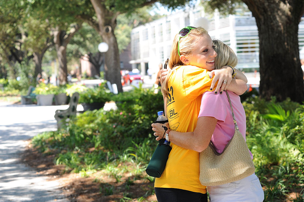 Group also processes appropriate ways to express feelings of frustration or hurt. ADHD teens struggle with mood regulation and as a result they feel everything intensely. Intense excitement and intense frustration! Therefore anger management groups or tips might be helpful so we offer teen anger management groups! Our counselors are child experts and are asked to provide advice on local & national TV & Radio including the Fox News, Daily Buzz, Fox 35, Channel 13, CBS, ABC’s Medical Minute, NBC, and more. Our child and family experts give advice on ADHD, Defiance, Anxiety, Bullying, Social Skills, Alternatives to Medication using Vitamins and Diet, Cutting, Eating issues, Video Game Addiction and more! 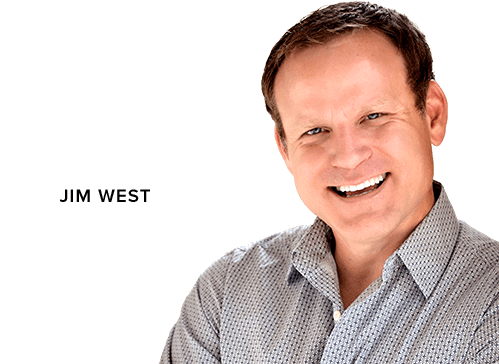 Jim West Child Expert in Orlando, East Orlando, Winter Park & Clermont International Communicator: Jim has been invited to speak for private school accreditation boards over the past 6 years including ACSI, Childrens Home Society, National School Social Workers & FACCS. He has spoken to thousands of teachers over the years and influenced private schools to provide special programs for students with learning disabilities, and accommodations for ADHD. His recordings at seminars are often the top requested! Our therapists are invited as guest speakers across the country on many topics effecting children! Our Orlando counselors have provided consultation to several private and public schools in the country as well as many local schools: Lake Highland Preparatory, First Academy, Pinecastle Christian Academy, Ocoee Elementary, Clarcona Elementary, Foundation Academy, Colonial High School and more. Our consultations include conflict resolution, accommodations for ADHD, character building, anti-bullying, student retention, and school improvement programs. We advocate for children and students with their IEP or Indivdiualized Education Plan & 504 Plans. Struggling with ADHD, ASD or Defiance? It’s Time to Stress Less! Everyone knows someone struggling with ADHD, ASD or Defiance. 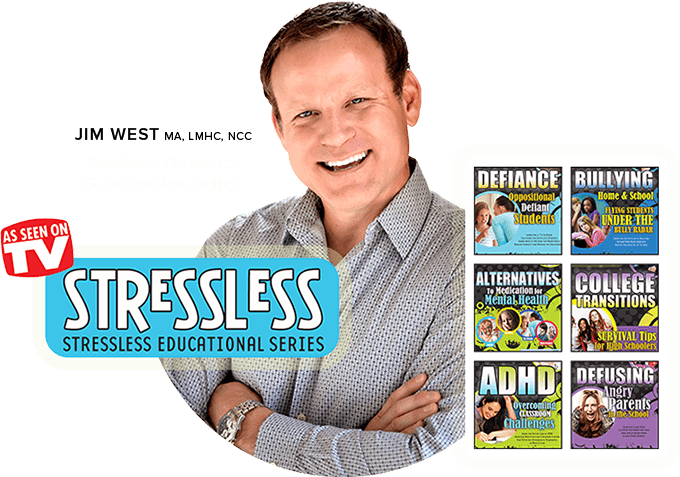 So, Jim West Developed the StressLess Educational Series as a comprehensive video program to help people all over the world! StressLess Now or Book Jim as a Guest Speaker Today! Click for more info and free video tips.